Papa, Noah and I love to hang out together. And yes, we are watching TV, but don't worry...I make sure to only watch a little bit. And look...I can hold my head up! Mama calls me Mr. Blue Eyes-do you think so too, Daddy? Oh! I learned what a remote is. Can you believe how many buttons there are?! We are both getting lots of snuggle time with all of our favorite people. Noah's even learning to use the computer...don't you want to come join us?!?! This time is just flying by! I can hardly believe we've already been here for 2 weeks! We have managed to pack so much into each day that the boys are taking some great naps! I initially thought we'd have a lot of quiet days at home, and we'd get a couple days of time at the library and zoo, but that hasn't been the case at all. I think we'll all be ready for a couple of days of staying home once we get back!! Ahh...now this is the spot, Nonni! Me and my monkey found the perfect spot to chill. We even got to spend a day with Steph and baby Beau. He LOVED the trampoline. And we had so much fun just getting to hang out. Does Auntie Katy look like a proud Auntie, or what?!?! Just doing my daily exercises. And what better way to cool off than by going to a water park. 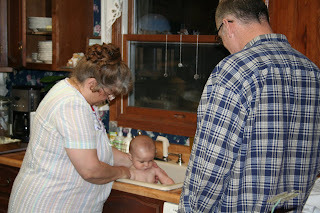 Noah wasn't sure what to think, but after some convincing, decided it wasn't so bad-so long as he face didn't get wet. We went and spent last weekend with 2 of my brothers. First we spent Saturday night with Robb and Melissa. We had so much fun playing with them at their house and then playing at an indoor breakfast themed playground. Noah loved bouncing on the bacon. :) Then Sunday we went to the community pool and got to cool off for a while before meeting Nonni and Papa for lunch. Are you making sure to get my good angle, Mama? Throw me high, Uncle Robb!! Check out my new best friend...he makes the best wrestling partner! And who needs a playground when you have an Uncle Mikey around?!?! Watching Noah's favorite movie...Madagascar 2. Then, as we were leaving, Uncle Robb told him that he should take a good nap so the security guard wouldn't get him and sure enough within several minutes on the road, Noah was sound asleep! He woke up right before we got to Uncle Mikey and Auntie Meghan's house and told me: "I took a good nap so now the curity guard can't get me." Today's your special day and we're so glad we'll be able to celebrate you tomorrow! Last weekend, we had some friends over (7 girls!) and had so much fun, but man the house was chaotic!! My mom left me in charge with all 9 children for breakfast one morning and I think I have decided that God is definitely not calling me to have a big family. I had kids asking for more waffles, more drink, more fruit, what life was like where I lived, if I had a trampoline when I was little-ALL AT THE SAME TIME!! I don't know how their parents do it on a daily basis! I was ready for a break after just an hour. We have also been having so much fun with our friend, Steph! She is so much fun to play with and talk to. You just need to move closer, Steph! Hi, Daddy! Just wanted you to know we were thinking about you and hoping you were getting along okay without us. Just in case, I had Mama stock up on extra boxes of tissues for you. Don't worry, we're taking care of Mama just like you asked us too. And yes, we're also looking out for each other too. I even shared my trash truck with Breven. Aren't you proud of me, Daddy? And look, I can even hold my head up now!!! Bright and early Monday morning, we took off to go see Steph B and meet baby Beau. Its about an hours drive away so it was a challenge getting everyone up and ready and in the car. We were trying to be there to go with them to their storytime at the library. We actually made it ahead of schedule and were able to walk to the library and have some fun. Beau is so cute and it was fun to have our boys playing together! Hmmm...what's the next order of business? Snacktime? Oh, that's right...a group photo!! And you know what's really hard...trying to get 3 wiggly boys to smile and look at the camera all at the same time!! Noah: How about if I sit over here then, Mama? Beau: Would you just sit down already...I'm getting tired of sitting here. Breven: Look, Mama...I'm all ready. We kind of started off to a rocky start. After being wonderful on the plane and having so much fun with all my family, we didn't get back to my parents house and into bed until about 12:30 our time! That's 4 1/2 hours past their normal nap time. They were up pretty early on Sunday and we enjoyed a day of seeing everyone at church, meeting Esha and having some yummy food back at Nonni & Papa's house. Noah even got a hair cut, and man, oh man does it make him look so much older! Trying to sit still for Nonni, but there is just too much to see and do! And the reward for sitting still so long? A nice bath in the sink! Looks like he's almost outgrown it! What a great way to snuggle! And hanging out with both Papa and Poppi...how could it get any better? Breven's had a really rough couple of days. Monday night he was up at 2, 3, 5, 6, & 7! Man was I tired! Luckily, I have a pretty great Mom who took Tuesday nights shift and he seemed to do much better. Noah was definitely our sleeper and never had a problem adjusting to a different time zone, but Breven is not quite so easy going in that department. I just pray I remember how to sleep at full 8 hours again when I am finally able to! Boys, boys and more boys!